Jon is a Professional Hockey Player and Entrepreneur- Follow Jon on Twitter @JonnyLa27. This weeks Thirsty Thursday Beer Review takes a dive into a Vermont “Altbier” – Copper Ale by Otter Creek brewing company. Middlebury, Vermont is a quaint New England college town located off route 7. With a great deal of character, this town is the epitome of all American “small town” feel. I’m not particularly fond of said, Middlebury College that is located here as they were an arch rival of mine back when I played hockey for the Bowdoin Polar Bears. Regardless of how I feel, this school has a serious history of dominating academically as well as athletically. The Panthers ruined my chances on more than one occasion at winning an NCAA championship. To make matters worse, I had to painfully watch them win two during my four years playing for Bowdoin. Let’s just say… I know this town and school a little too well. Vermont is beginning to be win over the rest of the world with regards to its micro brew scene. Something about the outdoors, trees and its organic culture coincide well with brewing good beer. 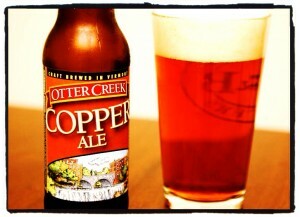 Otter Creek Brewery (OCB) opened its doors in 1991 and has since teamed up with Wolaver’s Fine Organic Ales. OCB has a variety of year round and seasonal beers available in 15 states in the northeast and midwest. They are available on tap and in 12oz bottles. My sister and her family were making the drive from Canada so it was only fair I had something cold to offer them upon their arrival. She always has something in the fridge for her brothers. I purchased a 6 pack at the local grocery store for $9.99. Appearance – upon first pour the copper and red amber colors give justice to the name. The head was fluffy and stayed throughout the tasting. Aroma – the smell was of sweet malt and honey with hints of grass. Taste – the beer hits the tongue with a hint of sweetness and general malt characteristics. The Copper Ale was extremely enjoyable and even though I was only holding a piece of Vermont in my pint glass it instantly made me feel as if I were there. The level of carbonation makes the beer very refreshing and the flavors make it taste oh so good. Altbier – translated means “old beer” and is a German style of brewing beer using top-fermenting yeast. Originally invented in Dusseldorf, Otter Creek brewing company adopted this age old brewing practice to their flagship beer – Copper Ale. Copper Ale food pairings – Otter Creek recommends hearty foods like Smoked Sausage, Grilled Salmon, Gouda and Roast Pork to accompany this tasty brew. I highly recommend tracking down the Otter Creek Copper Ale and I am looking forward to sampling other brews from this Vermont based microbrewery. Celebrating St. Patrick’s Day is not just for the Irish and leprechauns- but for everyone who wants an excuse to attend the parade, drink beer and be merry. 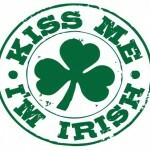 This special weekend is when a ton of men and woman get intimate with their beer and will see an abundance of green, ‘kiss me I’m Irish’ tees, Guinness hats, shamrocks and river dancing floats. 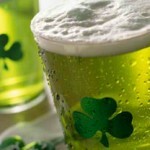 Oh, I almost forgot- Green Beer. Everyone has their own preference when it comes to this St. Patty’s day tradition. Me? I’m not too fond of the Green Beer concept, particularly of how it exits the body but it’s not to say I wouldn’t try it again. 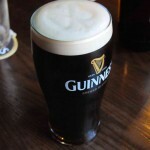 To me nothing says St. Patty’s Day like a pint or two of Guinness (read that over again in your best Irish accent). Maybe you’ll even get lucky and the bartender will draw a shamrock or heart in the foam. Surprisingly a lot out there are not Guinness drinkers. I believe as with most alcoholic beverages, you acquire a taste for the Irish beauty over time. Go to the source. I encourage everyone to get off their butts and go to Ireland one day. I have never tasted a Guinness as good as I did while visiting the Temple Bar in Dublin city center. There is an art to the perfect pour and they know how to do it. With Guinness, the fresher the better- so be sure to ask the friendly barkeep when the last time the keg was changed which shouldn’t be a problem over the next couple of days. If you are still on the fence about the heavier brew then I recommend you try what’s called a Black and Tan. There are many different variations of the concoction but it is simply a half Guinness and a half pale ale. I’m partial to Guinness and Harp. Here’s a great clip on how to pour your own Black and Tan. Black and tan is not only the name given to this delicious drink but also the name of one of Nike’s shoe lines (Black and Tan) and made headlines this week when they decided to change the name. They did so for two reasons: One- for the drink and, Two- because the name also applies to the Black and Tans; a British paramilitary force that smothered an Irish uprising in the 1920s. One word of advice going into the weekend is drink a glass of water between each pint of beer (especially if it’s green beer). You will make a few more trips to the pisser but guaranteed have just as good a time if not better and be thanking me in the morning. Everybody is Irish come St. Patty’s day. What’s your favorite way to spend it? 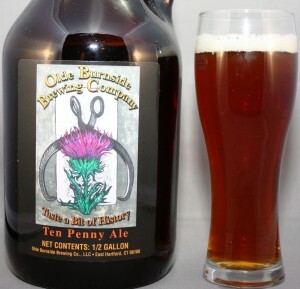 Today’s Thirsty Thursday Beer Review will take on The Olde Burnside Brewing Company’s micro-brew “Ten Penny Ale” and cover a little history behind Scottish Ale. While the New York Knicks’ modest JEREMY “LIN-SANITY” is jumping off the couch (literally) and taking the NBA by storm, a small micro brewery just up the road in Hartford, Connecticut has been getting its fair share of fame by producing some high quality brews. Any micro brewery that can hack it in an industry of major corporations and million dollar ad budgets is in my mind, like Jeremy Lin, a true unsung hero. If you don’t know who Jeremy Lin is I suggest you get off your couch and find out for yourself because it’s truly a heroic story, reminding us when we put our minds to it- anything is possible. Ten Penny Ale was awarded “Hartford’s Best Micro-brew” in 2005, 2006, 2007 and 2009, earning it some modest hardware (Connecticut). The name may also have some relation to its Scottish Ancestry. Scottish Ales were originally given their names based upon the taxes that were levied upon them. The lower the ABV (Alcohol By Volume) of a beer the less it was taxed. For example: A 3% ABV beer was taxed 60 schilling (the currency at the time) and higher ABVs were taxed at 70, 80 and 90 schilling. The Scotts used these taxes to refer to beer. Another example of this throw back to the old Scottish Brewing tax is seen with Odell brewery based in Colorado which calls one of its micro-brews- 90 Schilling. Scotland has a long pedigree of brewing beer even though traditionally the beer was made using various roots and herbs, and not hops. The reason for this was hops were very expensive to import and the main supply had to be purchased from England. This did not please the Scotts to say the least. Scotland eventually started to add hops to beer however being that barley was grown in massive quantities for production of Whisky the focus became all about malt brews. According to master brewer Joe Lushing, the Ten Penny Ale is a mellower version of a Scottish style ale that is second to none. This beer is available year round at local bars and beer stores. Upon request they even offer draught beer options- smaller kegs are perfect for the weekend BBQ in your backyard. Ten Penny Ale is copper-brown and lively with rich malt flavors. The ale gives off a heavy caramel tone while the head remains white and frothy. I highly recommend this beer for the casual beer drinker looking to explore the craft beer scene as there is very little hop bitterness. People are quick to assume that drinking craft beer is going to leave an extremely bitter taste in their mouth and stick to mass produce lighter beers. This assumption usually comes hand in hand from a first experience drinking IPA’s or darker burnt hop beers, however the Ten Penny Ale is highly drinkable and without any strong bitterness. This beer is a mild Scottish ale and is worth checking out. Even more so if you are into supporting an ongoing family small business tradition. Work Hard, Drink Well… and Lose the Beer Belly, not the Beer. Some of you might wonder how I decide which beer to review? To that I’d say- keep guessing… because there’s no real process to how I pick em. Suggestions are definitely welcome. Lucky for me, my girlfriend and roommate are on a beer kick and I found a Bavarian beauty kicking around their fridge. Thanks ladies. 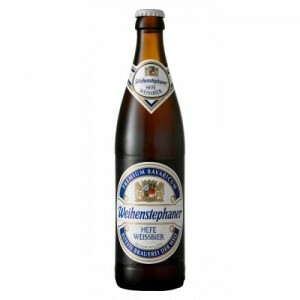 The Thirsty Thursday beer I chose to review this week is the German beer- Weihenstephaner Hefeweissbier. Say that 3 times fast. Because the inscription on the bottle reads, “The Worlds Oldest Brewery (Seit 1040)”, I decided a little history digging was in need. After a few Google searches and multiple miss spellings I came across the official website and really liked what I found – Weihenstephaner.de (Great video explaining the brewery’s origin and their new state of the art brewing science). Talk about history- the brewery use to be a Benedictine Monastery and in 1040 the monks were granted the right to brew beer. Petty cool monks if you ask me. Beer was a part of their daily diet and was even consumed during lent as it was understood the monks did not break fast by consuming liquids (keep that one up your sleeve the next time the old lady wants you to try out her new “fasting diet”). Today, not only do they brew beer but they study it as well. Weihenstephan is known as the Harvard of beer schools. 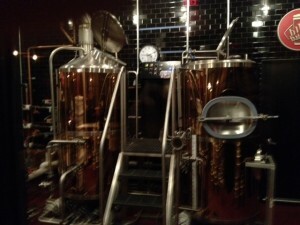 The tradition of beer is taken very seriously and the brewing behind it is considered a science. Being that the recipe for this yeast wheat masterpiece is a thousand years old, it’s safe to say they know a thing or two when it comes to brewing a tasty beer. Lucky for us, Weihenstephan Hefeweissbier is available year round, nationwide and comes in two sizes (12oz or a 22oz bottle). In a standard pint glass the appearance is a deep golden wheat. The beer is extremely cloudy and hard to see through. 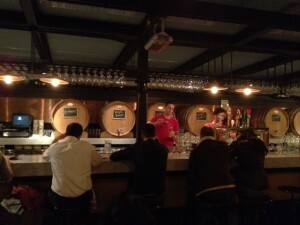 After a strong pour releasing some of the aromas, there was a full long lasting white head which hung around. 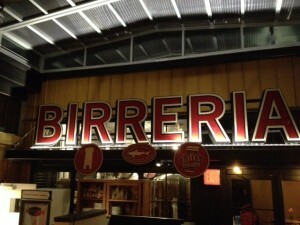 The beer let loose a general fruitiness and strong European Smell of Alcohol- likely from the yeast or Hefe. The beer is strongly spiced yet not overpowering. Fellow reviewers noted hints of banana but I’m not to sure of that. The taste was crisp with a light citrus and spice. A very strong bread-like malt on the tongue but it in no way overpowered the beer like I’ve experienced in other Hefes. This is a full bodied beer yet somehow a light tasting one at that. It is a very refreshing beer and comes close to matching one of my all time favorites which is also a Weissbier. I give this beer an A and if you’re on a patio enjoying the sunshine an A+. What better time to sample a Belgian beer than on a snowy Sunday afternoon watching not one, but two awesome NFL playoff games. Just to rub it in a little more- I later enjoyed some of New York City’s finest wings from Blondie’s with a tray of veggies on the side of course. Needless to say it was a good night for me and both, Patriot and Giant fans. Unfortunately, the same can’t be said for Raven’s kicker, Billy Cundiff after shanking a 30 yard field goal. I always feel for those kickers but nonetheless I’m looking forward to a heated rematch and some awesomely expensive commercials in a couple weeks time. 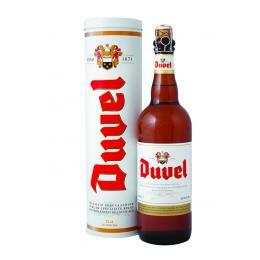 Sunday wasn’t my first time sampling the imported Belgium Golden Ale “Duvel”. My first tasting came while I was over in Europe playing hockey. A few buddies and I planned a road trip from Cologne, Germany to Antwerp, Belgium and hit up a Dave Matthew’s Band concert while we were there. After 10 of us piled into a van the trip literally started off with a bang. Our designated driver, lets call him “Shannon”, backed the van into a parked car while the occupants sat idling. Whoops. Not the best way to start off a road trip. I don’t know if it was the fact that we were ten hockey players in a van or that the damaged car was filled with illegal contraband but the mildly pissed off owner of the car said that we should go. It was good, and I mean really good. Served in a traditional tulip glass the foam rested on top of the crystal clear beer. Looking back now I can’t remember with much detail what I liked most about the beer. If I had to guess, it had a lot to do with getting it fresh from the source, the quantity it came in and the people I was with. Being an off day from the hustle and bustle I grabbed the 75cl bottle (the equivalent to 3/4 of a litre or approximately 26 ounces). To my surprise the bottle came nicely topped with a champagne cork and wasn’t something we often see here on this side of the Atlantic. Nothing is cheap in this city and I had to shell out a handful of dollars and cents, something I’ll gladly do over paying 5 dollars in any New York City establishment for a Coors Light. The alcohol content was a strong 8.5% abv.- giving you a good bang for your buck. Considering myself more of a beer connoisseur (definitely still a rookie) than I use to be, I opted for a reasonably sized red wine glass in place of the standard tulip shaped glass most bars serve a Duvel in. Honestly any glass will do and it is what makes you feel comfortable that is important. Just make sure it is clean, as I was reminded how important that is during a recent trip to ‘Beer School’ while visiting the Anheuser-Busch brewery in Colorado. Foam and bubbles stick to dirt in a glass and can make a good beer taste skunky. I gave the Duvel a steady pour trying to give life to the beer and was pleasantly surprised by the amount of carbonation and foam sitting a top the pale golden beer. The initial smell was on the sweet side but the yeast took over reminding me of Stella Artois (its Belgium cousin). The heavy foam which hung around forever made it look heavier than it tasted. The beer struck a mix of fruit and spice with a clean smooth aftertaste. Crisp and clean is the simplest way to describe this beauty. In my opinion this is a great beer for anytime, with anyone and with anything- 8.9 out of 10. Go earn it! PS. Stay tuned for highlights from my trip to Anheuser-Busch brewery, time spent with the Budweiser Clydesdales and Beer School. It would seem that everyone has their own expertise when it comes to calorie counting however when it comes knowing how many calories are in beer and alcohol, most fail to realize what they are consuming. This article will explore the amount of calories in beer, demystify the correlation between beer and the belly, as well as point out the nutritional aspects of beer when consumed in moderation. There are thousands of beer varieties and brands out there (thank you, thank you and thank you) each with a varied calorie content. 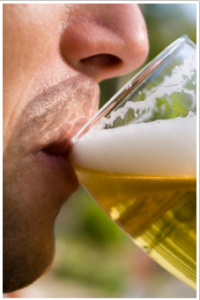 What it boils down to is this; the amount of calories in beer depends primarily on the alcohol content. There are approximately 7 calories per gram of alcohol. The higher the alcohol content- the more calories a beer will have. Generally Light Beer has a lower alcohol percentage and therefore has a lower number of calories. Because we live in a nation that is obsessed with knowing the calorie content of what we are consuming beer companies paste labels on the sides of light beer bottles and celebrate the reduced calorie content. They also make claims that the light beer in question comes with the same great taste as the regular stuff. We’ll let you be the judge of that. In contrast you won’t find the caloric value on a regular beer. 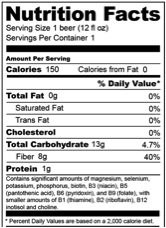 According to Malt Beverage Labeling Regulations only beer wanting to claim the title “light or lite” have to put their respective calorie content somewhere on the bottle. Over the last few years we have seen a surge of ultra light beers that now have 50-70 calories however not all light beers contain fewer than 100 calories. On average a 12oz serving of light beer has anywhere from 100 to 130 calories. Therefore if you plan on drinking a dozen light beers in one sitting you are adding over 1000 calories to your daily needs. The difference between a light beer and a regular beer could be at times as little as 20 calories. Are you really willing to sacrifice taste for a measly 20 calories? I for one am not. A common myth is darker beer contains more calories than its lighter counterpart. Remember, the number of calories in beer depends on the alcohol content and not the color or texture. The color is determined by the malt and hops used in production. Beer contains some healthy nutrients- Protein, Potassium, Folate, Vitamin B12 and Selenium. Yes, they are in small amounts but this is still way better than downing a 2 liter of soda/cola which contains nothing healthy and has 240 grams of sugar. Moderate consumption of beer has been shown to increase cardiovascular health by raising good cholesterol levels. It also acts as a natural blood thinner decreasing the risk of clots. Furthermore, Beer has high water content and is known as a diuretic which can both be associated with lowering the risk of kidney stones. You’ll understand this if you have ever had to break the seal after consuming a few brews. The Dietary Guidelines recommend that if alcohol is consumed it should be no more than two drinks for men and one drink for women in a 24 hour period. Drinking two regular beers has approximately the same caloric value as eating a double hamburger or two slices of cheese pizza so choose wisely and stick to moderation when consuming frosty ones. The message is constant and we firmly believe that men who do not drink beer can still develop a beer belly based on poor eating habits and lack of exercise. A high calorie diet of processed foods and restaurant-sized portions will lead you down the path of the dreaded beer belly. Extra helpings over the holidays can add up if one does not exercise. 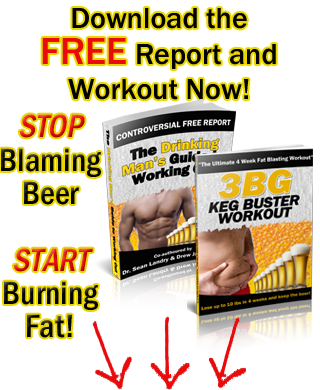 If you want to get rid of your beer belly fat follow these simple beer belly exercises that will help shed pounds and inches from your waistline. The danger lies in it being easy to consume “liquid” calories and when there is alcohol involved our judgment becomes skewed. This makes it even easier to fall off track and the very reason you need a firm goal to succeed. Drink to enjoy beer and not just to get drunk. Drink in moderation, savor the taste of beer, eat the way the body was designed to eat, implement some sweet full body workouts into your routine and you’ll never have to worry about the measly 20-calorie difference between a light beer and a good beer. It’s 10:20 pm and I just got back from a never miss a Monday session at the gym. I know it’s late and the last minute workout tonight will probably keep me up an extra half-hour, which I guess isn’t that bad because I’m reading a great book called Golf’s Sacred Journey. Sometimes life and a hectic schedule get in the way and you have to make time (even if it is a late night workout) to get the week started off on the right foot. During the pump I came to a quick realization. I forgot what weight I was using last week for the Dumbbell Step Up exercise. Don’t you hate when that happens? Especially when you go to pick a weight from the rack and within 2 seconds after starting the exercise you know that it’s too heavy. You’re only going to get a few reps in let alone finish the complete set with proper form. What an idiot I was. Keeping a workout journal is such a simple concept in the 3BG System and I forgot. It’s so simple to do. It takes seconds to enter your weight load during rest periods and jot down how you are feeling that day. Being able to look back on your week, pin-point areas where you might be feeling weak or areas where you feel you are improving is a huge part of knowing if you are heading towards your goal or moving away from it. A workout log or journal can even be used to keep track of the foods you consume throughout the week. In fact, it might be useful in the grocery store next time around. Seriously though, whether you are trying to lose weight or gain muscle it helps to know exactly what you are putting in your mouth (more on this topic later). Over the years I’ve seen a few ways to keep track. Printed out sheets, clipboards, a small spiral note book and now even iphone’s or blackberry’s can store notes. Personally I’d recommend you leave the cell phone in the locker room as nobody needs to listen to you jibber-jabbering to your buddies between sets. Whatever you decide be sure to get in the habit of doing it. You will pleasantly surprised a few weeks from now when you look back and see how far you have progressed. 2- I was using 45s last week not 110s. Before we get into today’s post, I wanted to give a quick shout out to the Braehead Clan and all of our fans from Glasgow and the surrounding areas. The season is about to get underway and you can expect nothing less than the best from this years squad. With the likes of returning players Jordan Krestanovich, Tim Wedderburn and Kyle Bruce this years season is bound to be a good one. Unfortunately I will not be returning to the ice in Glascow this year and you will all be greatly missed. After finishing my MBA this summer I’ve been working hard on a few business ventures and will be playing ice hockey in North America this season. I look forward to seeing all of you again sometime soon. Thanks again for all your support. 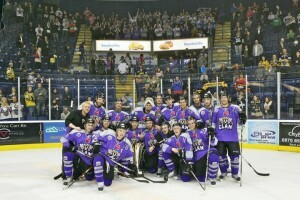 Below are a few of my on ice highlights from last years season with the Clan. Jon Landry #27 6’3 210 Left Defense- Montreal, Quebec. The NHL season is quickly approaching which means most men will soon be lighting the lamp and taking down a few brewskis with the start of Beer League Hockey seasons across the world. This is also the time of year most of you die-hard’s realize you are out of shape and decide last minute to do something about it. The doing something about it usually involves going for a 10 minute ‘jog’ because this is what you know. Then 5 minutes into the run, your heart pounding, lungs gasping for air, you begin to contemplate how you let yourself get so out of shape. Enough about how you got so out of shape this summer and more on how you plan on getting back up to speed for hockey this season. The boys and I here at 3BG sifted through a few workouts the pros use and tailored for you your very own “Beer League Hockey Workout”. The program will get you back to All-Star form in no time as well as help rid you of the summer beer belly. Hockey as you know is an extremely explosive and anaerobic sport. This hockey workout will focus on 45-60 second bursts of work with a minute of rest in between circuits to simulate a typical men’s league game. A key focus of the Beer League Hockey Workout will be on quick, explosive feet with limited ground contact time. You’re feet will be moving fast as your blood pumps throughout your body. Jon’s Dynamic Warm up (done before every workout and on ice session) approx. 5 minutes. All of the exercises should be performed one after the other without resting in between. Once you have completed all 3 exercises in sequence rest for 1 minute and repeat 2 more times for a total of 3 sets. Complete all 3 sets before moving on to the 2nd Circuit and repeat. 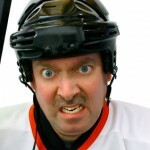 The Beer League Hockey Workout should be performed 2 times per week on top of your regularly scheduled hockey games. There you have it lads. 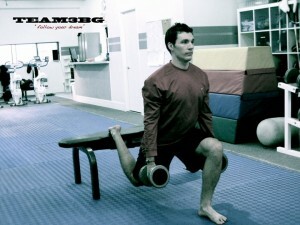 A quick and effective hockey specific workout geared to get your foot speed going and your anaerobic power back. Stay tuned for next months 20 Minute Workout. First up the boys and I would like to congratulate our Team3BG member, Graeme Kelly, for finishing his 10 Km race this Sunday in under an hour!!! A true accomplishment. Graeme, what beer did you reward yourself with? Keep the momentum going- ask yourself what’s next? 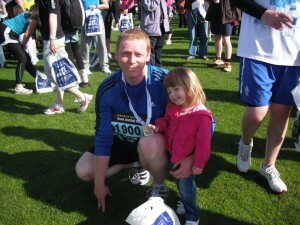 Another 10 Km, a half marathon, Everest? I arrived home after spending three amazing weeks in the Vancouver sun. Vancity completely redeemed itself this time around after giving me a measly 2 days of sun during my previous 5 weeks there. The trip saw many highlights including my cousin getting married, my dad climbing the grouse grind with us (66yrs young), and me completing my MBA dissertation. The latter happened three days ago and I think waking up this morning I’m finally caught up from lack of sleep. Honestly, I was a little surprised that I finished with all the distractions of the summer. There were times during the process where I didn’t think I could do it. Particularly when my Macbook and entire years research was stolen from my car while helping out at the Mike Fisher Charity Hockey Camp in Ottawa. To make matters worse I found out my external hard drive (or I) had not been backing up my work and thoughts about quitting my MBA started to drift into my head. With the deadline fast approaching it was hard to see myself making up for lost time and finishing but I had to at least try. I borrowed a buddy’s computer and went to town. It’s funny, I can not remember ever having a set back of this magnitude before and my mind kept playing games on me. Frustration started to set in as for the life of me, I could not remember all that I had done and what I had written. This is exactly what we see with guys we help coach and inspire to workout again. When someone first starts exercising they tend to beat themselves down and confidence is at an all time low due to the disappointment of where they are starting from. With frustration levels at an all time high my mom recommended I take a step back from the paper, clear my head and take it out on the old punching bag we have in the basement. Ironic because she hates the idea of me fighting on the ice but man, did this ever help. Three rounds later and sweat rolling down my forehead, my focus was back and I was ready to tackle the mountain that lay ahead. I used the punching bag a couple of times when I was close to my boiling point but it was exercise and other workouts I did throughout the re-write that managed my stress and got the ideas flowing. Through exercise and movement I was able to develop new concepts and philosophies. I re-wrote the entire paper making it better than before in record time. There is nothing better than the feeling of accomplishment. You set a goal and no matter what gets in your way- you achieve it. It gives you a feeling of confidence. A sense of knowing there isn’t anything you can’t take on. And you know what? It’s contagious. Besides catching up on sleep, over the last two days I’ve taken time to reflect and enjoy the weight lifted off my shoulders but I haven’t stopped. I’m on to my next goal- training camp is three weeks away.